started this site in 1997 with only a vague idea of what I wanted to feature. Karen and I did a lot of traveling, much of it focused around our volunteer activities with Earthwatch on archaeology projects. We took the projects seriously, studying up before and after and the project location provided a focus for more extensive travel for sight seeing and experiencing the culture. That seemed like an interesting possibility, as did the long hikes we took as part of the sight seeing. So archaeology and hiking became part of the site. Finally, I'd recently begun studying Jules Verne's classic 20,000 Leagues under the Sea with the aim of making an accurate reconstruction of the submarine Nautilus and the web site provided a forum for that. It was a surprise to me that the original English translations of 20,000 Leagues were seriously deficient so a page on the novel and another on the Nautilus completed the site. Next I needed to find a unifying theme for these diverse subjects. The novel and the Nautilus were easily connected. Archaeology is the uncovering of a record of history and if I considered a novel or writing in general a kind of history I had a justifiable connection. Hiking in the natural landscape led me to the connection with geology and deep time, although more superficial landscape changes happen in historical time. So time appeared to be a unifying concept. Reading and evaluating the descriptions in a novel, archaeological excavation, and contemplating the landscape while hiking all became kinds of time travel and the site was born. Over time the relative importance of parts of the site evolved. My study of Jules Verne and the Nautilus and communication from others with similar interest led me to the unusual cigar ships and submarine technology in the nineteenth century. I recreated the Nautilus in 3-D graphics and that reconstruction concept easily migrated to the cigar ships. The recovery and subsequent excavation of the Confederate submarine Hunley had an obvious connection to Nautilus part of the site and to the archaeology pages. With the Hunley I had the opportunity to illustrate and comment the archaeology using the experience I'd accumulated in months of field activity and to apply the reconstruction techniques I'd developed for the Nautilus and the cigar ships. After a decade Gallifrey had crystallized as the unique source of information on the Internet for the Nautilus, the cigar ships, and the Hunley reconstruction, while the rest of the site became something of a pedestrian sidelight. The search engines showed this for the Nautilus and cigar ships. A proliferation of sites on the Hunley diluted the search ranking for that section, but my own surveys have consistently shown that my Hunley pages provide more and better information. n 2010 personal web pages were discontinued by AT&T. Forced to restructure the site, I took the opportunity to reevaluate the theme. Considering the unique appeal of the three main parts and acting on a recommendation from a colleague, I decided to emphasize the unified relationship among them - nineteenth century technology - but expressing it as the Jules Verne connection. The steam punk genre, which springs from that time and technology, appeals to me but I wanted to only hint of this. An unrelated comment by someone who prefers the "Era of Jules Verne" to "steam punk" led me to the site name. Finally, still liking the less popular personal pages about archaeology and hiking I found legitimate if tenuous connections, when one considers the history of the era. Through a misunderstanding/miscalculation on my part, the original site disappeared only a day or so after the premier hosting of the new site. Hence I lost the opportunity to link the two sites and a decade of search engine ranking was gone. Still the unique content is the same and will get better. I'm sure what was will be again. here is a connection between the two images on this page, the front page graphics for the two incarnations of site. 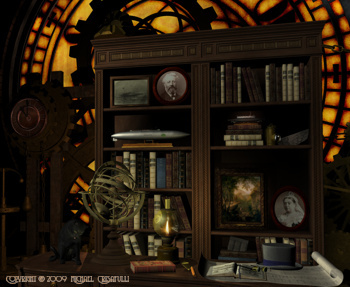 For most of its existence, the Gallifrey home page featured a stylized image of the Prague Orloj astronomical clock, chosen to symbolize the time dimension of the site. The graphic on the Vernian Era home page plays off that by going inside the clock. It includes objects, that refer directly or indirectly to the site concept or site content or symbolize connections between the Vernian age and the content. The old image symbolized the time travel theme. The new image remembers that but now emphasizes the technology. This page and its contents © Copyright 2010 Michael & Karen Crisafulli, except as noted.